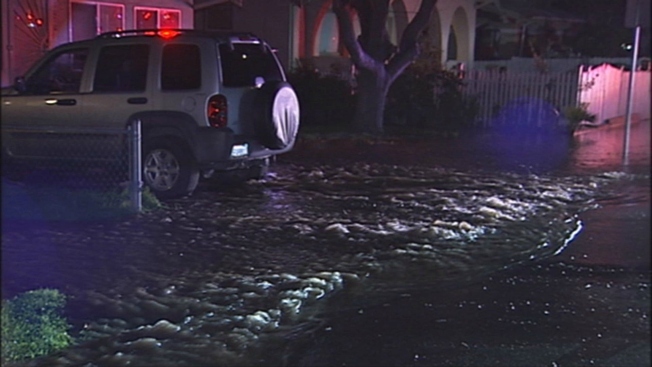 A ruptured water main spewed water across four city blocks in Pittsburg, flooding homes and leaving residents stranded through early Thursday. Firefighters and police were greeted by a muddy mess at Black Diamond and West 11th streets around 9:40 p.m. Wednesday. The gushing water filled up the basements of four homes and two apartment complexes, damaging them, according to Battalion Chief Jim Huntze. Some people were trapped inside their homes because their yards were submerged under nearly two feet of water. Debris, household items and children’s toys also floated in about two feet of water in a three-story building at 45 West 10th Street, Huntze said. "It reached past my stepdad's knees," said Valerie Naranjo, who lives on Black Diamond Street. Sophia Spinosa, who lives in the neighborhood, was devastated that her family's two cars, one of which was a Cadillac, were destroyed. Even their backyard was completely water-logged, she said. "Everything that my dad worked for is gone right now because it's all flooded," a tearful Spinosa said. It took nearly 90 minutes to turn off the water and about three more hours to repair the line and turn the water back on. "We're just replacing a water line that broke and fixing seven feet of pipe," said city worker John Pebley. The water main break nearly created a sinkhole at the intersection. “We did have a buckle in the asphalt where the water main [break] basically took the dirt that was underneath the asphalt and threw [it] up onto the sidewalk and undercut the entire asphalt area,” Huntze said. Crews will ensure the roads are secure before cars are allowed in the area. Pittsburg City Manager Joe Sbranti declined to comment about the potential cause of the water main break, but said it caused thousands of dollars’ worth of damage. Once city crews have dug up the area, they will be able to evaluate what may have triggered it, he said. He reassured city residents, however, that this water main break was not normal. "checking into this to avoid [it] in the future."